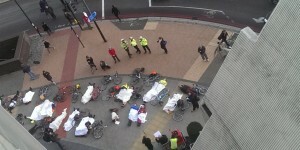 This petition calls for action on the HGVs & buses which pose the greatest danger to cyclists and pedestrians. 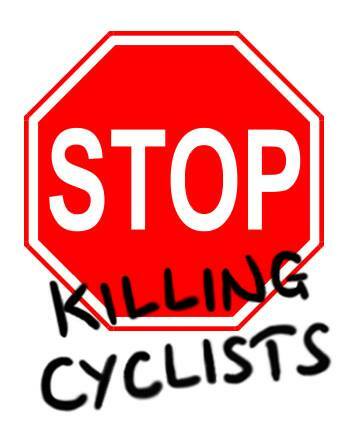 After another truck killed a cyclist at Vauxhall, Stop Killing Cyclists calls on the London Mayor to take immediate action to stop the carnage. We’re launching this petition to call on the mayor to step up enforcement of truck safety with immediate effect. Stop Killing Cyclists held a demonstration at Vauxhall Cross in December 2013, following the 6 awful November tragedies, calling for greater enforcement of truck safety regulations and emergency segregated cycle lanes to be installed at left-hand turn junctions like Vauxhall Cross and Elephant & Castle. We have submitted proposals for Elephant and Castle which are under consideration and a scheme for major improvements at Vauxhall has been promised this summer. There are also issues with the design and legislation around these vehicles, but that isn’t within the power of the mayor to change so isn’t included in the petition. However it is something we will be campaigning on.